"A refreshing biscotti reminiscent of the tropical drink. Great with tea or coffee! I never really measure the ingredients after rum but I've tried to approximate for you... My friends LOVE this recipe!" In a large bowl, cream together the butter and 1 1/3 cups of sugar until light and fluffy. Beat in the eggs one at a time, mixing well after each one. Stir in the rum, pineapple juice and coconut extract until well blended. Combine the flour, baking powder and salt; stir into the batter. Stir in the pistachio nuts, pineapple and coconut until evenly distributed. Cover and refrigerate for about 10 minutes. Preheat the oven to 350 degrees F (175 degrees C). Lightly grease two cookie sheets. Divide the dough into four equal parts. Form each piece of dough into a 12 inch long log shape on a lightly floured surface. Place two logs onto each cookie sheet, and pat down until they are about 3 inches wide. There should be at least 2 inches of space between each log. Bake for 30 minutes in the preheated oven, until firm but not crisp. Remove from the oven, and allow to cool for at least 10 minutes. 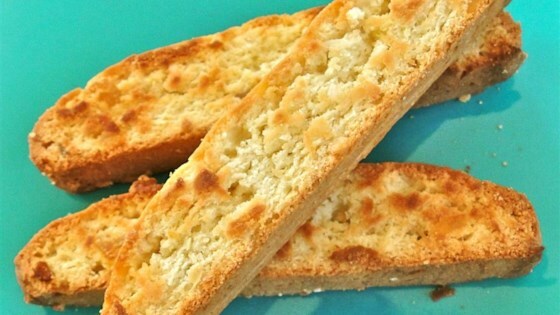 Place the biscotti bars on a cutting board, and use a serrated knife to cut into 3/4 inch wide diagonal slices. Return the slices to the baking sheets cut side down. Return to the oven. Bake for 8 minutes, then turn the cookies over, and bake for an additional 8 minutes, or until lightly toasted. Cool completely, then store in an airtight container. These turned out so good! I will be adding these to my Christmas cookie goodie bags that I make a gifts. Thanks for the great recipe! Very good. I drizzled mine with melted white chocolate.